Unsurprisingly, given the upcoming Netflix show, Marvel is also bringing back the Defenders in the comics, with writer Brian Michael Bendis and artist David Marquez. Which is, on the one hand, a nice attempt to create a comic that people watching the shows can use as an east entry point. On the other hand, it does sound like a craven money grab with a name people will recognize. The Hollywood Reporter made the announcement of the new book, which will have the same core creative team as Civil War II. It also spoke with Brian Michael Bendis and Marvel senior vp executive editor Tom Brevoort about the new series. 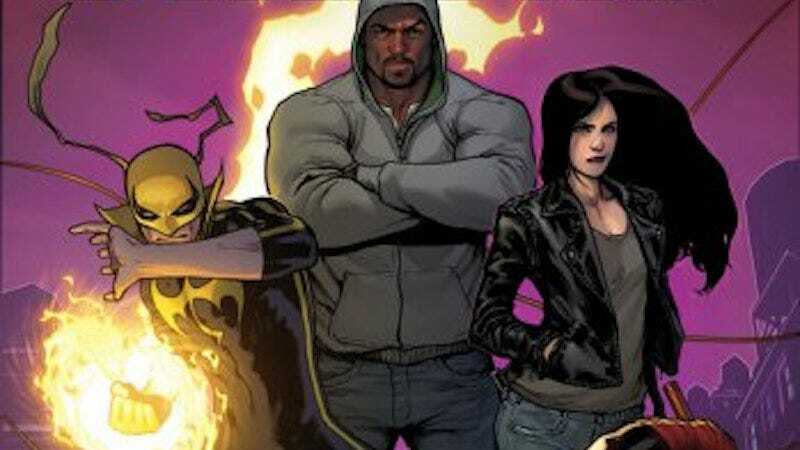 Brevoort says that this iteration of The Defenders is based in Bendis’ 2012 New Avengers run. You will get Jessica Jones looking out her window, street-level, and my return to Daredevil, which will be different than what I and Alex did before. And Luke and Danny, characters that I have a strong affinity for. I spent most of the oughts being mocked for the love of Luke Cage. Now that Luke Cage is a household name, I just sit back in my chair and laugh and laugh. It will be interesting to see what Bendis does with Jessica Jones and Luke Cage, who are estranged as of her new series. Or, in true comics fashion, we’ll have a completely different interpretation that fans will have to reconcile for themselves. And, again, this book is taking some cues from the Netflix shows, putting all the Defenders in New York and working together against crime there. Bendis called it “a sprawling, Godfather-like epic at the street level of the Marvel Universe” focusing on organized crime in a “modern” way. Despite all that, there’s a fair amount here that feels like a retread of things that Bendis has done before or that Netflix is doing. Only time will tell.